Cant believe Christmas has come and gone. Im so grateful that Josh was able to be home this year. And also that he is no longer gearing up to go on a long deployment right after Christmas. Which always seems to be the case. Joshs Mom, Dad and sister Erin came down to Italy to visit! It was a great time. It was nice having family here. We played card games, my all time new favorite was trivial pursuit card game, which I picked up from the BX for less than two dollars lol. We blew through pretty much all the trivia cards LOL. 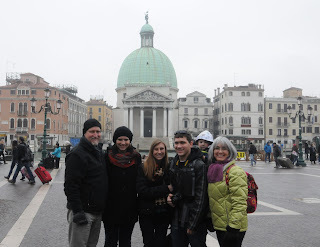 We also ate pizza, went to a market, and the last big thing we did was go to Venice. Venice is a very beautiful city. Felt like a huge maze with bridges and stone floors. Josh took a lot of great pictures. Its hard to take in a lot of the beautiful sites here. Its still crazy to me that yes Im standing here in Italy. Just nuts! Ethan enjoyed his Christmas and opening presents All of them even if they werent for him lol.